Graduated from the Faculty of Architecture at the Warsaw University of Technology (1999) and the European Academy of Photography (2005). PhD studies on photography at Academy of Fine Arts in Warsaw (2014). Belongs to the Association of Polish Artists Photographers. Architect, designer and photographer. Her photographs have been shown in numerous individual and collective exhibitions in Poland, Ireland, Portugal, Holland, Germany and US. She participated in an interdisciplinary project The Promised City with her photo-documentary series Crossing. 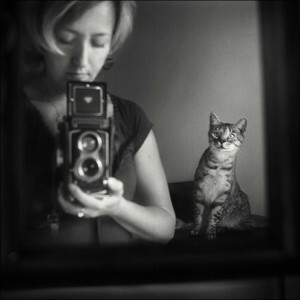 She received an award in the international 5th Annual Black&White Spider Awards in Still Life category (2010). Her works Between Two Moons created in wet plate collodion process was exhibited in The Art Of Photography Show in San Diego, California, in the FotoArtFestival, Poland (2011), Biennale Photokina (2012), PhotoIreland Festival (2012), Biennale of Photography Reykiavik Ljďż˝smyndadagar Island (2014) and in the Warsaw Festival of Art Photography (2015). The winner of Wet Plate Competition Canada (2012). Her photographs have been featured in many publications, including SHOTS Magazine, SOURA Magazine, BLOW Photo Magazine, PRISM Photo Magazine, SEITIES and others. Enthusiast of analogue photography , works with Medium and Large Format Cameras. 2012 September – Cover for SHOTS Magazine no. 117, Autumn 2012. 2008 September – Cover and portfolio issue no 22 of Soura Magazine / Dubai, United Arab Emirates.